So over the past couple of months, my exercise regimen has taken a bit of a dive. (Part of the reason why I wanted to get this blog started! I need you readers to help keep me accountable!) While also amazingly enough, my running stamina has increased. No idea how that works but hey! can’t complain too much about the running ability! This morning, I ran in the Orioles KidsPeace Trick-or-Trot 5k. This is actually the third year that I’ve done it, and today I ran my best time, 30:05, my mile average time was 9:19!! This run is a blast! 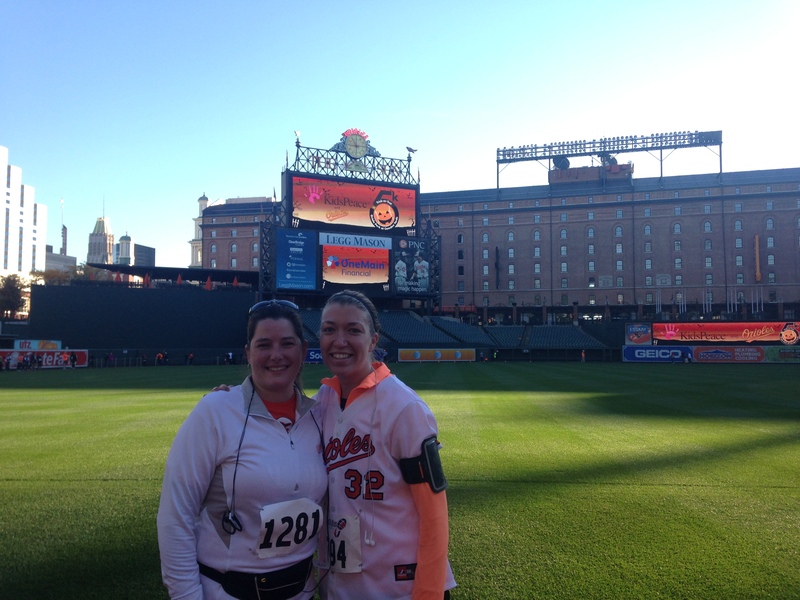 You run from outside the ballpark, to the inner harbor, through Federal Hill, and then back to the ballpark, ending on the warning track.. Plus, you get to high-five Angela (and maybe Buck) Showalter crossing the finish line! This year, I didn’t wear a costume, but next year, Beth and I are planning a group costume – since my time is well off the mark for winning an award for my age group – and we want to win the award! We’re thinking either Ghostbusters theme, with someone dressed as Slime, or Star Wars related! Anyone want to go with us? The more the merrier of course! Other ideas? Beth and I after finishing the run! While I’m quite proud of the progress I’ve made over the three years since I ran my first Trick-or-Trot 5k, at the moment, my exercising schedule has become nearly non-existent, while my waistline is becoming evermore … existent. Starting at the beginning of November, my plan is to revamp my exercise plan, as well as my eating. This time of the year, it is so easy for healthy eating to fall apart. It was actually this time last year that I started P90 and lost 10 pounds (and several inches off my waist). My plan this year is to get back on the Beachbody train, and restart PiYo, while also keeping up with running. PiYo is a mix of Pilates and Yoga – probably some of the best workouts I’ve done! The emphasis is on flexibility, which is something I need desperate help in. I have an issue with the bones in my back (which I can’t seem to remember the name of), that basically two bones in my spine are out of alignment. Which leads to the muscles in my back working that much harder to make sure everything stays together as it should. This leads to my hamstrings being extra tight, all the time, and me being much more susceptible to injury. PiYo has been a godsend to me, helping my flexibility and strength in my back. But it only works if you use it! So I’m hopping back on the wagon starting November 1st! Disclaimer: I don’t receive any reimbursement from Beachbody. All views in this blog are my own.